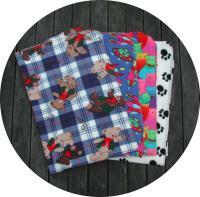 Our fantastic range of fleece blankets are available in all our plain and patterned fleece fabrics. Great for using as a throw for your sofa or bed or just snuggling up in front of the TV. Our fleece blankets are handmade by us in the UK and each blanket is overlocked and hemmed to give a professional, luxurious finish. We do four standard sizes of fleece blankets - cot blanket (approx 100cm x 140cm), pram and buggy blankets (approx 70cm x 100cm), picnic blankets (approx 140cm x 140cm), single bed blankets (approx 140cm x 200cm) or you can choose your own size. Can't see the size you'd like? Contact us with the measurements of the fleece blanket size you want and we'll send you a quote.